We recently went to a to-remain-unnamed Italian restaurant near our home. The waitress was pleasant and the food was adequate to the task of making us no longer hungry, but that’s about all I can say to recommend it. As I thought about what kind of review I might give it, I realized that I don’t have the streak of meanness necessary to be a good food critic, or really a critic of anything. It was not horrible, there might be other things to recommend the restaurant that we didn’t sample (although we did have the night’s specials – one would think they would have something to recommend them, but I digress), and it is someone’s livelihood and perhaps even pride and joy. So, I’ve decided that unless a restaurant is truly horrible in some way, I will not post negative reviews of merely disappointing dining experiences. Which brings me 180 degrees to City Fish Grill in Oldsmar. A co-worker recommended this restaurant almost two years ago, and even though it’s only a few blocks from our home, we had never been, mostly because it’s packed on Friday and Saturday nights and we never plan ahead well enough to remember to make reservations. Last weekend, though, we were at a nearby hotel attending a conference and knew in advance we’d want to eat somewhere very nearby. We reserved a table for 10 early in the evening and when we arrived were greeted by very friendly staff and shown immediately to our table even though our party was incomplete. I wish I had thought to photograph everyone’s dinners, especially the Seafood Tower, an appetizer one of our group ordered as his main meal. The first thing on our table was the hot bread served with dishes of olive oil swirled with a balsamic reduction and a little shredded parmesan. I had a cup of she-crab bisque (served in a good-sized bowl – I don’t know how big the bowl of soup would have been) that was delicious. I guess the bisque satisfied my craving for seafood, because I then ordered their special filet mignon topped with a blueberry/balsamic reduction glaze. The feta au gratin potatoes were not as tasty as I might have liked, but then I had already had she-crab soup and a 9-oz filet to tackle. The finishing touch, though, was the vanilla crème brûlée. I love crème brûlée. 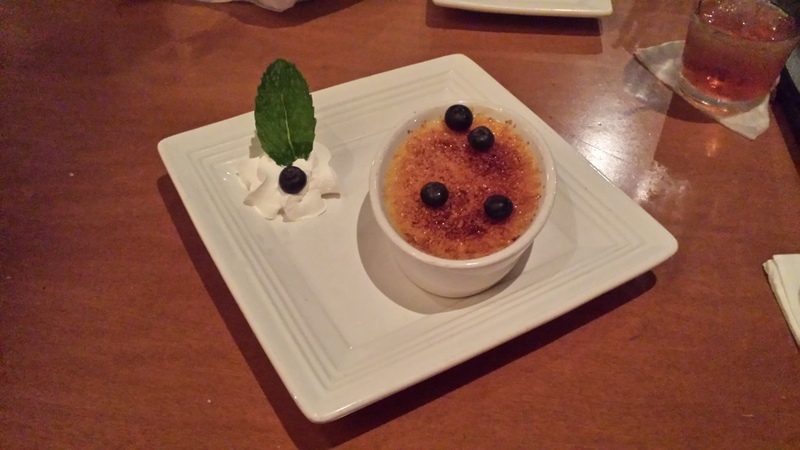 And although I am always on the quest for the perfect crème brûlée, I have only a vague memory of perhaps having once had a mediocre crème brûlée – never a bad one. City Fish’s crème brûlée, though, definitely falls into the delicious category. A generous portion of wonderfully rich and creamy vanilla custard topped with beautiful, crisp caramel that made a delightful crunch as I broke through it with my spoon (fans of Amelie will appreciate that reference), and garnished with blueberries and whipped cream. It was beautiful and delicious. We will definitely be going there again. It’s good enough to remember to make reservations for.